I haven’t forgotten you; I just had a very busy run-up to the Society of Biblical Literature meeting, was busy at the SBL (presented two papers, chaired three sessions, various committee meetings, etc. ), then came back to a challenging metabolic shift and a stack of essays that awaited marking. I’m on the verge of finishing up the essays, I have some emails to write, notes to hand-write, a handout to complete, and some last-week-of-classes obligations. But lo! It is in fact the last week of Fall Semester classes, I’m near finishing up my obligations, and I’ll have a little breathing room to take stock and figure out how to adapt better in the spring. I plan to post the papers I gave in New Orleans, but they need massaging first. Today is Pippa’s birthday, which makes me proud and happy. As I’m giving a talk Monday afternoon about the relation of theology to rock music, it’s only fitting and appropriate that I forestall workin on it by putting together a playlist of the kinds of song that particularly interst me as a theologian. I’m ruling out U2 and Bruce Cockburn at the outset, not out of distaste but because they’ve been the focus of a lot of theological spotlights. I’d rather not pick performances that ordinarily would be recognized as straight-ahead gospel (though I may be soft on that judgment). My favorites for this exercise invoke, or flirt with, or hint at theological themes without coming out and clobbering you over the head with them. Or if they do make the theological motif explicit, the selection in some other way inflects the overt theologizing with a less straightforward nuance. Or, maybe I just like it, so there. I’ll think of more — always working on gender balance, and I have to put them in order — and I might slip in George Harrison’s “All Things Must Pass” to honor Dale Allison’s paper on George in the same session, and maybe a hiphop selection to honor Valerie Bridgman’s paper (“Jesus Walks” would be obvious), but for now that’s it. Chris Corrigan (Hi, Chris! It’s been too long) tweeted a link to Jeff Ely’s blog, where he describes how his students devised a new twist on playing Scrabble: open bidding for letters. Sounds intriguing. D’you know of whom I want to see more in this concluding season of LOST? I’m tired of Jack and Locke and Ben, Kate’s beginning to wear on my nerves, and many of the rest of the islanders have worn out their welcome — but Mr. Eko had a strange backstory, he was a cool character, and his death left a variety of dtails unresolved. Bring back Mr. Eko! Lucy Knisley gets it just right: Books are precious and wonderful, but it’s the wrong idea to try to smother the digital baby in its crib — that only makes for vengeful survivor-adolescents, and it’s bad for the soul of the smotherer. Digital texts offer advantages that print media don’t. We should be concentrating on ways we can take full advantage of (and improve!) digital media, and those of us who still want books can by all means keep buying and collecting books. Suw: still makes me cross that museums like V&A aren’t putting images of paintings they hold, e.g. from 1806, into public domain. AKMA: @Suw There’s a great contribution to be made by some fndtn underwriting good, reproducible digital versions of pub[lic] dom[ain] texts/images/music. Suw: @AKMA I could not agree more. I understand museums need to make £££ but they should be adding value, not charging for basic image. AKMA: @Suw “Adding value, not restricting access” = FTW. Artificial scarcity is a losing tactic. Now, I already thought the world of Suw, both from converations in olden online times and from when she was so tremendously kind and attentive when I learned about my father’s impending death at Freedom To Connect last year (it seems so long ago!). I’m impressed with (and keeping an eye on) her start-up, Book Oven. And she too sees that the rearguard action of trying to prevent the future only costs the publishing industry money, delays its acclimatization to the present, and frustrates and alienates some of its pivotally-important customers (to wit, the digital natives who populate Scribd and other such havens of PDF-downloadable goodies). There’s no way to come out ahead by resisting digital media — at least, not once you factor in the hidden costs of continuous on-going security r&d, lawyers, damage to reputation/good will, alienation from tomorrow’s mainstay buyers, and so on. I used to irritate students in my language classes by urging them to let Greek teach them Greek — that is, by reading along and observing what Greek authors actually do with the language rather than by ingesting a bookful of rules and definitions that the authors may never have heard of, and expecting the texts we read to be controlled by the rules. So too with digital media: sooner or later, the publishers and distributors will have to let digital media teach them how to prosper in digital publishing. Cory Doctorow and Radiohead have shown that freely-distributable works do not equal “no payment for creators.” Artistic creation didn’t begin ex nihilo when copyright was legislated, and it would continue (in different ways) if copyright were absolutely abolished. But since no one, so far as I know, is suggesting that copyright be abolished, why not step up and meet the future on the future’s terms? Why not use digital media for what they’re good for, print media for what they’re good for, copyright law for what it’s good for, and unleash a lot of imaginative energy that’s been pent-up by lawsuits, rootkits, nostalgic anxiety, self-protective lobbying and legislation (what Cory and Doc called the Anti-Mammal Dinosaurs’ Protection Act). The NPR Fifty Top Recordings of the Aughties series covers a great deal of excellent music, calls to my attention some items I had neglected, and (of course) omits plenty that I’d have included. As is always the case, the point of a Top X list is to get readers arguing among themselves, so have at it. I tend to dislike discussion forums, but Dooce’s newly-instituted forums include two recent topics to which I wanted to link. The first is the question about memorable matches between movie scenes and soundtrack music; the second is the topic “How do you react to a public toddler tantrum?”, to which I respond by linking to this ad from UK television. Not that I approve, of course, but (a) the mom’s appearance reminds me of a student I once had (don’t remember which); (b) the reaction shot of the formerly-tantrumming kid is terrific; (c) the mom’s expression and gesture to the kid after her tantrum are spot-on. Been there, haven’t done that. I mislaid my calendar. I do that every time I try to keep a calendar responsibly. I hate it when that happens. Rocker/theologian/designer Michael Iafrate has a sister Janet who published an article on Harry Potter and peaceable resistance. Well done, Janet! The Bishop’s Office has contacted me; I have a “Permission To Officiate” license, so if you’ve been biding your time, waiting for me to perform some sacramental action, now’s your opportunity. This morning, I hurried downtown to meet with the Dean of the Diocese of Glasgow and Galloway (the episcopal see is vacant for now, and the diocese is led by the Dean, who is not (as in US polity) the “rector” of a cathedral, but is a senior cleric in the diocese; the cathedral’s senior cleric is a Provost). We had a convivial half hour’s conversation, at the end of which time he deemed me safe to turn loose upon the diocese. I hastened from there back to my office in time to greet several students (I’m in charge of signing requests for extensions for the department, and right about now that makes me the object of a lot of attention), have a quick conversation with the Head of Department, grab a bite of lunch with a neighboring scholar, connect with a student to talk over the preceding assignment and discuss the next, scramble to class (where I could be in the same place addressing the same topic for two blessed consecutive hours), headed back to the office to gather my paperwork for home, and stride purposefully back to the flat. 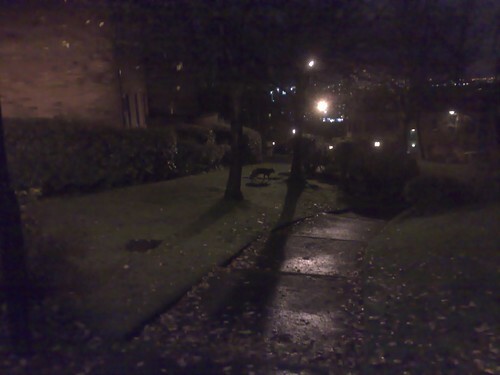 At the entranceway to the block of flats, I saw (for the third time) a fox. Evening had already fallen, so I had only the illumination of the light pole, but you can see the fox’s eyes reflecting back at me from the bushes. And then he scampered away, perhaps to besiege the neighbor’s last remaining chicken. In this week’s Sesame Street video voting, Kermit’s “Bein’ Green” should be a lock to walk away with honors, but I was never that crazy about it. Second place will go to “Rubber Duckie”; I think I have to cast my vote for Ernie, though it’s tough to bypass the earworm “What’s The Name of That Song?” Cookie Monster’s version of the “Theme from Shaft” rocks; Big Bird’s “Alphabet Song” is a delight, and “Everyone Makes Mistakes” serves a useful pedagogical purpose; I’ll never get the Ladybugs’ Picnic” out of my head (“They talked about the high price of furniture and rugs / And fire insurance for ladybugs”). I’ll go cast my vote, then check the leaderboard. 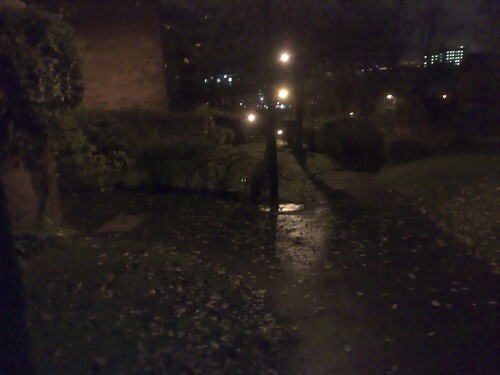 As I was walking home from the laundry yesterday, I looked around and realized that Glasgow doesn’t feel exotic any more. It’s just a place. I live here. Most of my relatives are gathering in New Haven this afternoon to pray and sing, to remember and give thanks for my aunt, Isabelle Tuttle DeWitt. My feet are planted squarely in Scotland, but my heart aches to be with my family at Trinity Church on the Green: to recall my elegant, dry-witted, steadfast, generous aunt; to support Margaret and my sister and cousins, and to lean on them for support; to share with Holly and Margaret in representing my mother at the service, and in the gathering after. Ninety-nine days out of a hundred, I’ve felt all right about being here in Scotland. This morning I felt all right about being here. Tomorrow I’ll feel all right about being here. But tonight, as people are bustling around the church, meeting up at designated points, making their several ways to the center of the city where my mother and my aunts grew up — tonight I wish I were back in the USA, doing what family does. I’ve been to two cleaners in my neighborhood already, and neither of them offered the option of starching my collars and cuffs. What’s with that?